2. You MAY NOT redistribute this mod. 3. You MAY use these assets in other mods, after contacting me for permission. You MUST contact the original authors (see " 3RD PARTY ASSETS USED IN MOD" section for details) if you wish to utilize their assets in other mods. 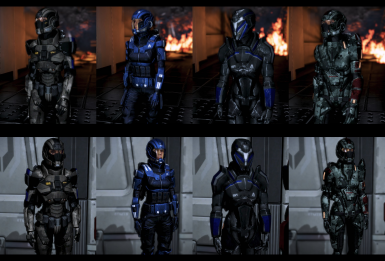 If using original assets in other mods, you MAY modify them. If using these assets in other mods, you MAY NOT monetize the mod (this includes donations). If using these assets in other mods, you must distribute those mods under my permissions. 6. You MAY NOT use this mod in other creative works (YT videos, etc) that are subject to ad revenue. 7. You MAY contact me with a request to amend any of the above permissions for this mod. Ashley Warpack, and its associated iterations hosted at its Nexus page, are not associated with BioWare. I make no money from this project. This mod is supplied "as is" and you use it at your own risk; I am not responsible for any damage to your game or PC by use of this mod. All inquiries regarding this mod must be directed to survivor686 via Nexus Mods’ messaging service. The Ashley Warpack, and its associated iterations, utilize the following textures and meshes which have been graciously provided by the following authors, without whom this mods would have not been possible. - To ELE08 for allowing me to utilize assets from the Ashley Legacy Project, for the "Legacy Edition"
Thanks to the many, many people who helped get this project off the ground! The latest main file has been updated with a higher mount priority to completely prevent conflict with SP controller mod. Heavy Spectre Armour (Ashley 03, +25% Power Recharge Bonus): Forged by the Hahne-Kedhar Shadow Work's best engineers, this armour proves that humanity takes the responsibility of having a Spectre very seriously. 1. Does this mod supersede other Ashley combat mods? No. Don't worry, if you made/utilized any modifications to these files, they will remain. 4. Do I need additional files, in order to use this game? Yes, you'll need Warranty Voider's modified DLLs. Don't worry these are available from this Nexus page, or are pre-installed with ME3MM.